The Musics of Furede Riko: SUPER Sentai HERO GETTER ~199 ver. SUPER Sentai HERO GETTER ~199 ver. Tobidase! eien ni toki wo koe saikyou senshi ON PARADE! Fly! Cross the eternal time the ultimate warriors on Parade! Gaoranger's howl like hundred beasts - Blow the shinobi wind Hurricanegers! Magirangers are a magical family - Looking for the precious Boukengers! Make those legends, our Super Task Force! I want to sing so I better remember them! Super Task Force Lets go! Find the shiniest treasure. Let's go pirates! Ohhhhh The Exciting Pirate Task Force GOKA-I-GER!!! In less than an hour from now, the final episode of one of the best shounen shows (in my life) will be airing. I'll be watching that live, thanks to the wonderful software called KeyHole, with just a tad of hope that my suckass internet connection won't stand in the way. February 19th 2012, TV Asahi, 07.30 AM (meaning 05.30 my regional time), that's when the 35th Super Sentai Series, Kaizoku Sentai Gokaiger will bid their farewell from my regular sunday morning. For those of you who are interested in J-Entertainment, the name SUPER SENTAI (SS) is obviously NOT a stranger to your knowledge, cause it has been one of the long running show / franchise of all time in the industry. Since it first aired on 1975, as a counter part to the longer long running show Kamen Rider, SS has reached the life of many children, particularly boys... and became their role model as well as something to look forward to every week. Some of you are probably more familiar with the Americanized version, that is called with the none other than*drumrolls* the POWER RANGERS (PR), which was designed to adopt most of Super Sentai original footage, usually with the same story, but with US actors to make it more US friendly. It was a very brilliant idea that eventually introduced the original series to a more international-oriented market. I was one of the avid follower of PR, but when I finally realized that they just legally-copied the Japanese show, my interest has eventually shafted into the originals. I don't hate PR, in fact, Jason, Rocky, Billy, Kimberly, Kat, Adam and the rest are still living in my memories as my childhood heroes. However, I felt that as years go by, the show was treated in a much less inspiring and entertaining way, and the PR series eventually faded from my fandom. My last regular PR series that I still had the patience to watch was Lightspeed Rescue. It's a totally different case with SS. Sure, I haven't watched every series, and only a few I have watched full house (all episodes), but it was damn much much more entertaining for me. You can call me a Japan-biased fanboy, but perhaps the fact that I grew up completely with the series is the reason. My first SS series ever was the 6th team, Dai Sentai Goggle-V. It was the 1st ever series that was brought and went into high anticipation in my country, when it spreaded out like fungus in Betamax format. When I came here to visit my family during holiday (yes, I lived in different city in the past), it was our regular holiday event to go to the rental, rent the series, and watch it together. After that we would always role-play as the heroes. It was a TOTALLY fun childhood, and I wouldn't mind going back to just experience that moment once again. Well... I was somewhat bullied in school that my friends usually forced me to role-play as Google Pink all the time though, but then again, for the very 1st time in history, MALE Pink Rangers will be around -even for just several seconds. Yes, indeed, Google V was totally VERY cool back then. My dad even took me and my kindergarten best friend, to an official live show downtown, where we would just clamored the heroes as loud as we could. We returned home riding a double decker (it was a popular public transportation and actually ran daily at the time) and fell a sleep. Now that I think of it, I kinda miss that best-bud of mine, cause only God knows where he is right now T.T. Anyway, my dad also bought me an audio rip cassete of Google V, that I absolutely listened everyday. I ended up being able to sing the theme song, and people started asking me to sing it for them... and now I've realized, perhaps that was how I got so 'intoxicated' by Japanese songs (and entertainment). So, SS was one of the benefactors that influenced me to fandubbing XD. With the exception of Timeranger, I was able to watch all the newer (to the newest) title with the help of internet. Some are still on the waiting list, cause it's not yet finished. I managed to get a hand on Time, Kakuranger & GoGoFive lately though, so, among all 35 titles, only 6 shows I haven't personally experienced myself. Counting some that managed to get air time, I have completed all episodes of 12 out of 35, and of course Gokaiger will be my 13th today. How come it's only 13? The reason is simple, among those 35, there were shows that totally got on my nerve, sometimes with weird plot, unusual plus annoying themes, or I just cut it halfway because I tried focusing on better shows. For example, I only watch 1-2 episodes (and the movies) of the series prior to Gokaiger, because well... it's simply too terribly annoying for me XD. My top 5 favorite among them are: Abaranger, Boukenger, Goonger, Shinkenger, and of course, now, the number one position goes to Gokaiger. However, being a fan to Gokaiger actually didn't come as easy as you think. To be completely honest, when the news about Gokaiger, as the 35th anniversary series, was revealed, I was definitely very skeptical about it. Probably because the rumor said that Gokaiger would be: 1. A pirate themed team, 2. They will have the power to morph into past Sentai. Eventhough I'm not a hater of One Piece (but I'm not a fan as well, despite the fact that I'm currently watching the final arc), the concept of Pirate alone already made me felt afraid that it would spoof One Piece's fame. Added with the fact that Kamen Rider Decade had already -IMHO- butchered the concept of form-shifter, by being such hideous disappointment throughout the entire series, and created a huge mess to the KR universe I've known for years as well. I do admit it was fun to see Decade turning into past Riders though, but it's also more annoying to follow the series that felt like some messy fanfics botched down into one story. I was definitely reluctant when the idea was going to be implemented to SS. Yes... "ONORE DIKEIIDOOO!!!" My fear started to fade when they showed the cast in their regular suit. It looked... 'different', and for the first time we had a guy with pony tails. The looks of these cast shouted 'anime' for me. After that I managed to catch the leaked footage of the cast using the ranger keys (to turn into All Reds) when they cameod on the Goseiger vs Shinkenger. I was amazed with how they handled the transformation, as well as pleased with the gender crossing thing. My Decade anxiety was turned into huge curiosity, and I couldn't wait to see the series premiere. You can check Wikipedia for a complete list of them, and you might also need to check the movies personal pages as well, cause each has their own guest stars as well. 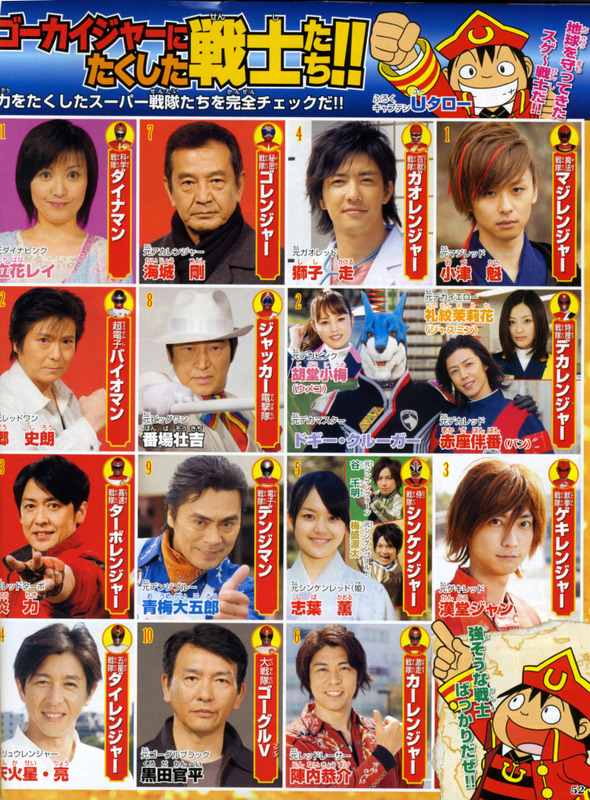 Just looking at these pictures, already showed the amount of seriousness TOEI has put for Gokaiger. EVERY series, has a representative now, even if it comes a bit late like Zyuranger Goushi (take that Power Ranger whiners!). More than that, we even have rumors that these guest stars (with several new others: GoGreen, MagiPink, GoonBlue...?) will be making another cameo appearance in the final episode. Being the best anniversary show so far, the Gokaiger has a tremendous exclusive treatment as well. In less than 20 episodes airing, the cast premiered their 1st big screen treatment, a cross-over movie with the previouse team Goseiger, as well the anniversary movie: Gokaiger Goseiger Super Sentai 199 Hero Great Battle. For me personally, this is ONE HELLUVA Movie I've ever seen in my life so far! Never, had a Super Sentai movie managed to capture my attention, and captivate me so much that I trembled in goosebumps and actually cried tears of joy. TOEI really give a lot of effort for this movie, that it even do justice to Goseiger for me. Shinken vs Goon was awesome, Gosei vs Shinken was at the same level, but this movie... totally ROCK MY WORLD! I can dare call it, one of the BEST Super Sentai Versus movie eveeeeer! After that, they returned to the silver screen, for their own team's movie: The Flying Ghost Ship. The movie is quite nice, but compared to the previous movie, it's totally out of scale. I didn't expect big anyway, cause SS's solo movies were always less satisfying than their versus. At the end of 2011, it was announced that the cast would return (again) to the silver screen, and that it would then be paired to a very iconic hero from my childhood era as well: The Space Sheriff Gavan. During my Goggle-V era, Gavan and his friends were also a very popular show distributed via Betamax. I was unfortunate to NEVER been able to see any of the show though, but that fandom flaw of the past is going to be gone soon hahaha. Gokaiger vs. Gavan: The Movie had just premiered last month, so without any doubt, I'll finally able to see Gavan in action in the near future. I can finally say to my childhood friends (not that I'll be able to meet them very soon though) that I, just like them, have (finally) watch Gavan as well! 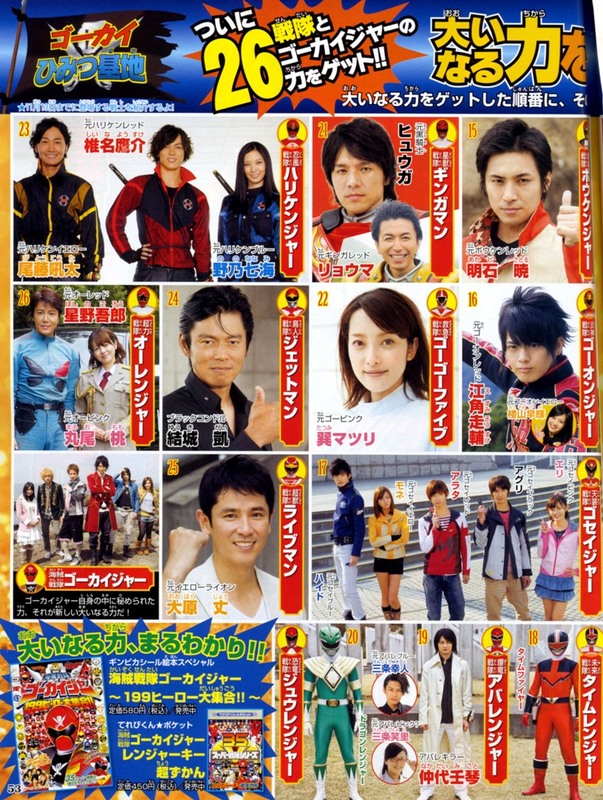 Last but not least, I'm still hoping for another cross over movie for Gokaiger. It's a trend that a Super Sentai team will meet their previous senior in a cross over movie, like the one Gokaiger had with Goseiger. 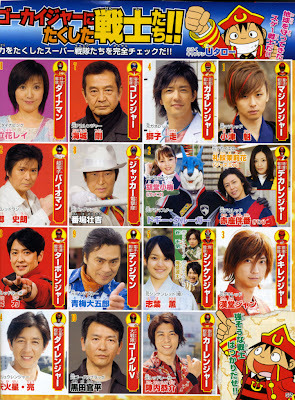 It's possible that Gokaiger will meet its junior sometime around next year as well. However, with all these special treatments already been given to them, I kinda doubt another crossover movie will happen. Then again, I mustn't let my hope's down yet, cause when it's worth the money, I'm sure TOEI will do it, for the money, if not for fans XD. Anyway... enough with the history of Gokaiger, let's go to the cover song! The song I'm covering, is the shortened movie ending version of the TV ending theme. This song is sung by Project.R, a team of musician that is comprised of various Super Sentai's OP/ED/Insert Theme songs performers throughout the years. It's also an anniversary song as well, cause the lyrics are totally simple. Shouting each and every Super Sentai title, along with their respective theme. Basically a song that will make everyone to recall back on the past series. Eventhough I have been wanting to sing the opening theme of Gokaiger, I've realized that this song is much more fitting to honor of Super Sentai celebration, so, a sudden change of heart and I recorded this song instead. Project R. - Super Sentai Hero Getter ~199 ver.